Obviously, it's impossible to fix everything about Facebook that irritates you. You have a job, and a life - trying to stay on top of all the various updates and tools, in order to tailor your experience exactly as you want would likely take up a heap of time. But there are a couple of simple things that I've found which have made Facebook work a little better for me. First, there was a time when Page owners could "Like" other pages as their Page instead of themselves, and when said Page owner went to view their own Page, there would be a link to the "Pages Feed", a timeline of posts from those Pages that you were following as your business Page. For reasons unbeknownst to me, Facebook has made that link disappear, but the feed does still exist. You just have to know where to look for it. Keep in mind that you can't see the feeds of other Pages (hence, why the above is not a link), but you can still view the Pages feed of any Page you manage by modifying the above URL to your Facebook Page address. Secondly, there's the ever-present issue of what your friends share on Facebook. Let's face it, there's no avoiding some of the more polarizing opinions of your friends and contacts, no matter how hard you try. That said, you can take advantage of some of the tools Facebook provides to clean things up a bit. On any post, there's the three little dots icon in the upper right-hand corner. Clicking on it will show you the available tools. Here, we have a post that someone I know shared from the 'Aunty Acid' Facebook Page. The first set of options under enable me to save the post, hide it, snooze the source of the post, or hide everything from that Page. 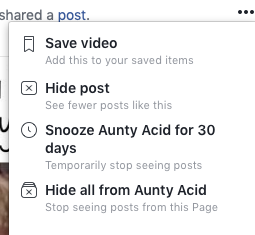 Underneath that, not in the screenshot (to protect my friend's name), you also have the option to snooze that friend for 30 days, or unfollow them completely. Think about the options here when you see a particularly eye-rolling share. Is this person someone I even want to follow any more? We've all connected with some friends from way back who've turned out to be a little loud in their views about things. If they aren't bringing anything of value, there's no shame in not following them any longer. It's cool, we get it. It's not worth the mental health hit you take every time they show up in your feed. Is this someone you normally do value keeping in touch with, but maybe want to drop during a particular news cycle? Snoozing is a great way to just get a break from the constant barrage of shares that make FB less fun right now, even though you don't want to completely lose touch. Think, for example, of snoozing a few Patriots fans after the Super Bowl, right? Are they sharing something from a Facebook Page that you know you never want to see again? We all also have that one friend, the one with the adorable baby, or the great sense of humor, who somehow also likes to share each and every conspiracy theory they catch from their favorite tin foil hat source. Maybe consider leaving your connection to this person alone, but blocking, or snoozing, the Page that they've shared from. I've made a habit of using this tool - I've gone the 'Hide' route on a number of fringe political pages, on both sides of the political aisle, because I'm not on Facebook for the politics. That keeps a lot of the more vitriolic posts out of my feed, and enables me to focus on connecting with people without all of that. Lastly, if none of this fits, or if they're posting a link to something outside of Facebook (or just typing in text that you wish you didn't have to see), you could choose the 'Hide Post' function. This one isn't as strong as the other options, but it can nudge the algorithm a little bit. It sends the message to the algorithm that this is the kind of thing you don't really have much use for, and it should therefore make it less of a priority. And, yes, at the very bottom of the menu there is also be a place to report the post for the most egregious types of content. I haven't made much use of that, as I don't tend to follow people who would post that kind of thing, but it is always an option. Let's be honest here - part of the reason that Facebook makes us all a little crazy is our own fault, we haven't always been overly selective about who we follow and now we're kind of stuck with all of it in our feeds. In light of that, it's high-time many of us starting looking at things more selectively, and while its far from perfect, Facebook has provided us with tools to do just that. Take advantage of them, and save yourself some anger.